"When everything's ready and everybody's out of the way, then we can push the button. That's the ten seconds of glory." Few images turn heads faster than explosive building demolition footage. We watch, fascinated, as thousands of tons of man-made structure that took months to erect comes crashing down in mere seconds. Playing to our inherent fascination, producer Brent Blanchard has brought us the What a Blast Collection on DVD. This two-disc set combines What a Blast: Special Edition and What a Blast: Architecture in Motion. Both are also available separately. Detonation Countdown is a 48-minute documentary in four sections, each focusing on a specific demolition expert doing a particular job. From these in-depth looks at the process, we learn a lot about the mechanics, science, timing, and politics of explosive building demolition as well as the massive amount of preparatory work required to do the job effectively and safely. First, we meet the husband/wife team of Eric Kelley and Anna Chong (owners of Engineered Demolition) as they set a new world record for most buildings "shot" (industry term for bringing down a building or structure with explosives) at one time. The specific target is the 20-building Calgary General Hospital Complex. In some of the film's most incredible footage, they drop the entire complex in 27 seconds. Next, we watch as Steve Pettigrew of Demolition Dynamics performs an incredibly precise drop in downtown Kansas City with only fourteen feet of clearance between the building to be shot and the building next door. We meet Steve Rainwater of DemTech as he shoots an old railway bridge in Logansport, Indiana that rests only two feet from a working bridge that cannot be damaged. Finally, we travel to Alaska to watch the father and son team of Jim and Jared Redyke (Dykon) drop an old paper mill in an environmentally sensitive area, executing the shoot during a heavy downpour. The second documentary included on this disc is What a Blast: For Kids, a child-oriented program presented in a style similar to the "For Kids" documentaries aired on The Discovery Channel. Narrated and hosted by teenager Althea Chow, this 30-minute feature covers the same type of material presented in the other features in a more child-friendly format. The inherent dangers of explosives and fireworks are covered, accompanied by stern warnings. The final documentary is called Demolition Artist. This 50-minute program is very similar to the first feature, Detonation Countdown, but focuses more on the demolition experts themselves with less emphasis on the mechanics. Many of the blasters introduced in the first documentary reappear here. We meet Dale Evans of Precision Explosives as he drops the Constitution Bridge in Lockhaven, Pennsylvania. Next, we meet Merritt McAlinden and his son "Tex" as they detonate underground charges to create trenches for a construction project. We again see Steve Pettigrew who, in an interesting twist, is teaching his father the finer points of building demolition as they target the Robert Meyer Hotel in Jacksonville, Florida. Next, we see Steve set the world record for the longest blasting sequence as he takes down Fulton County Stadium in Atlanta, the first major sports stadium in the U.S. taken down with explosives. We again join Eric Kelley and Anna Chong as they shoot the Frank Lou Hotel in Montgomery, Alabama, the Conners Creek Powerhouse (which requires that they demolish the phased-out half of the power plant without hurting the attached operational half), and their world-record-setting blast of the massive Sears Distribution Center (outside of Philadelphia), a structure covering 2.7 million square feet. Next, Scott Gustafson of DemTech, who specializes in more rural structures, drops a huge coal silo conveyor structure and the Midland Trail Bridge in West Virginia. Finally, we rejoin the Redykes as they shoot portions of a West Virginia steel mill. The second disc is entitled What a Blast: Architecture in Motion. The main section of this disc is a 42-minute music video of building demolition footage set to 8 songs by the masters of electronic rock, Tangerine Dream. If you are a fan of Tangerine Dream, you will especially enjoy this section. 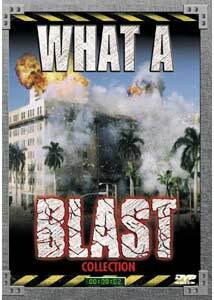 An additional 10-minute feature entitled World's Best Blasts shows multiple angle footage of eight major explosive building demolitions, including Fulton County Stadium, the RCA/Victor Complex in Camden, New Jersey, the Wolverine Hotel in Detroit, the Bunker Hill smokestacks in Idaho, and the Kretchmer Public Housing complex in Newark, New Jersey. There is more than enough material here (3 hours worth) to sate any appetite for explosive building demolition footage. Furthermore, the information presented on the science and strategy of structure demolition and explosive timing and placement techniques is quite fascinating. The only major fault I can find is that the material is rather repetitive, especially if you choose to view all of this material in one long sitting (as I did.) Stock footage of several different structure demolitions is used over and over again in the various features. After three hours, the "coolness factor" starts to wear off. Image Transfer Review: Since most of the building demolition footage was shot with cameras of different types and with film of varying quality, the image quality ranges from excellent to mediocre. Some of the vintage footage is of relatively poor quality, but this is understandable considering its age. The interview segments and most of the modern sequences are of good documentary quality. Graininess is visible in many of the shots, but this is understandable given the nature of the presentation. Overall, this is an eye-pleasing presentation with interesting camera angles, including a few cases in which cameras on the roofs of target buildings allow us to witness the demolition from the most seat-of-the-pants view possible. One production gaffe is that the discs are physically labeled "1.85:1 Anamorphic widescreen." However, unless there is some hidden Widescreen menu option that I couldn't find, the entire series is presented in full-frame only. Audio Transfer Review: One very attractive feature of this 2-disc set is the DTS sound offered on both discs, though the offered sound formats differ otherwise. On the Special Edition disc, DTS, Dolby Digital 5.1, and Dolby 2.0 surround tracks are offered. On the Architecture in Motion disc, DTS and PCM Stereo tracks are offered. The sound is generally very good but, like the video, the filmmakers were at the mercy of on-site microphones of varying quality used to record the blasts. The sound quality of the blasts themselves is usually below that of the background music and interview segments. However, in DTS and DD5.1 mode, LFE is significant and the surround channels fill the room with explosive noise. In a side-by-side comparison, I was unable to determine any significant difference between the DTS and DD5.1 tracks on the Special Edition disc. Dialogue in the various interview segments is generally crisp and easy to understand, and the Tangerine Dream music sounds rich and full in DTS on the Architecture in Motion disc. Extras Review: With a special interest presentation such as this, it is difficult to separate the "extras" from the "feature," so I have described all of the content in the main disc review section and have assigned this title a "B" for extras. No subtitles are offered with this 2-disc set. The Special Edition disc is dual-layered, while the Architecture in Motion disc is single-layered. The double-disc packaging contains disc spindles similar to those of an Alpha keepcase, but no identifying manufacturer's stamp appears on the packaging. With about 3 hours of total running time, the What a Blast Collection is a sure-fire pleaser for anyone who is interested in explosive building demolition, likes the synth-heavy music of Tangerine Dream, or just likes to watch stuff get blown up.